Ask most people if they keep a journal and they will share with you the struggle to keep it consistent if they have one at all. Yet journals are an important part of our lives and our history. As we write in our journals, we become more self-aware. It's easier to express ourselves and to make the connections. If we aren't keeping a journal, we are skipping over history and important lessons. There are 2 keys to consistent journal writing. First devoting the time and second, finding a style of journaling that works for you. Once you let yourself out of the box of what journaling is supposed to be, it becomes a lot easier and more fun! You are more willing to devote that time to journaling when you are enjoy it. My kids are begging me for Wreck This Journal. Read the different ideas for journaling below and do the one that excites you the most. Then put a reminder in your phone for the next month to help you develop that consistent journaling habit. One thing that holds some back from journaling is they feel like they have to write so much every day. If you are afraid of the time it'll take, try this short journaling method- Journaling at a Glance. You only have room to write a couple of sentences each day. The box on the right gives you space to track a goal, the weather, or your emotions for the day. You can use this page for journaling one week on one sheet or the same day each year for 7 years. I love doing it for 7 years because you can look back and see how you've grown and remember past important events which motivates you to keep going. Click the image to the left to download a free sheet. If you're a list maker you'll love this journal. Instead of writing about what you did each day, make a list each week about your goals or things you like to do outdoors. The 52 Lists Project is divided up by season to keep you in the moment. If you are someone that needs to experience things more than write them, this is the journal for you! Wreck This Journal gets your creative juices running with suggestions for poking holes in the paper, floating a page, coloring outside the lines and more. Make writing down the most important things a weekly habit after church. Write about the things you learned at church, special moments you had during the week, General Conference notes, or inspiration you received while pondering. Think of your Sacred Journal like the golden plates- only the best of the best goes in it. Cross off that bucket list and record your many adventures as a family! 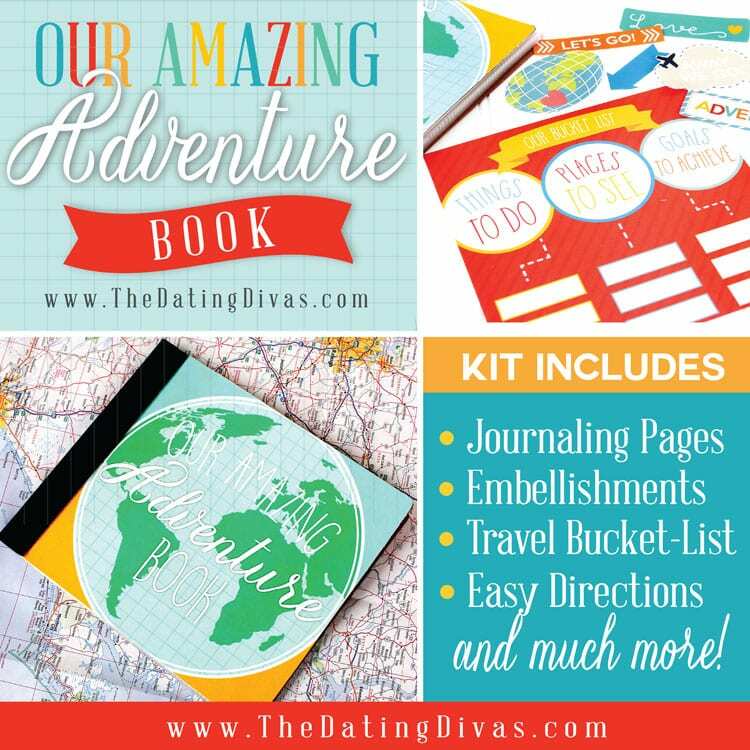 This Adventure Book from the Dating Divas helps you organize it all while inspiring you to write it all down. Bucket list is included! Print out a picture a day and share a little about it. Afterall, a picture is worth 1,000 words. You can use this free template to get started. Get a bonus photo journal page plus lots more in our Family History Packet. Head over to Life's Journey to Perfection to print out a Journal Cover label for your book. Click the image to print a free photo journal page or buy the whole packet in the Market. Get your whole family in the act even if they are spread across the country. Share a Google Doc with your family and add to it each week. You can insert photos, drawings, thoughts, and comment on each others posts. It's a great way to stay in touch and record your history together. Try something a little more personal with the Just Between Us Journal. This one is meant to be between only two people. There are prompts throughout to help you share plus extra note pages for your questions and funny conversations. It's a great way to open communication channels between you and someone you love. Share your thoughts, feelings, and promptings while searching through the scriptures. You can pick a particular topic like The Family Proclamation Study Journal in our Market or get a basic scripture journal format for your regular daily study. Gratitude journals are especially popular come Thanksgiving but try it out the rest of the year. This Gratitude Journal from I Love It All does it smash book style to allow you to include those little keepsakes each day and really express your gratitude. You can start it any time of the year and pack it as full as you'd like. Use promo code GRATITUDE through March 8 and get 20% off your total purchase from I Love It All too! Record your testimony each Fast Sunday and watch it grow throughout the year. Write your conversion story (we all have one even if you were raised in the church) then your current testimony. Read them to strengthen your testimony or share them with your family and friends. Click the photo on the left to print your free Testimony Journaling sheets. Make one of these every Leap Year and put it in a time capsule. It's a great one to keep a record about yourself and enjoy the the fun of looking back. A Year of FHE has a great one to print out for free. You can take pages from a few different styles and create your own unique journal. It doesn't matter so much as to how you keep a journal, it matters that you do keep one.